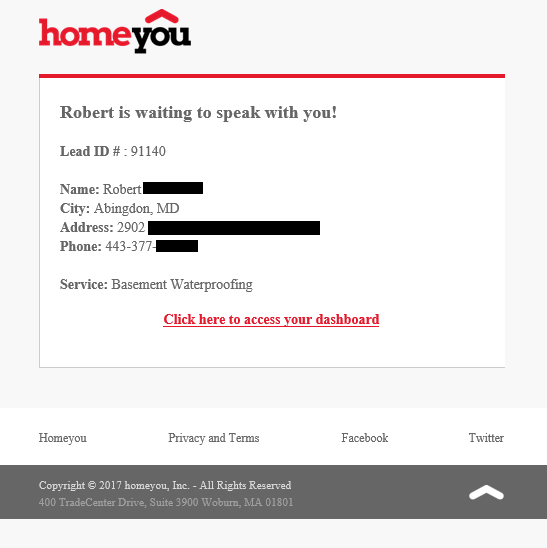 Example of a basement waterproofing lead arriving from Homeyou via email. Every contractor has heard about Google AdWords, commonly called pay-per-click or PPC, at some point in time. Organizations selling PPC typically demand high budgets and charge management fees on top. Rather than committing to thousands of dollars in ad spend, contractors can dip their toes in the PPC waters using Google AdWords Express. This self serve platform is ideal for contractors who would like to see how AdWords work and if it fits their business. When setting up AdWords Express, contractors can call Google directly for over the phone help. The phone number is 1-866-246-6453 and wait times are usually minimal. “Your current customers are your best customers.” Consider promoting a different service to your current customers. For example, if your roofing business also does windows and siding, send an email to your past customers with a special offer related to these services. If you have 1,000 customer emails, a 0.1% hit rate would yield 1 lead while a 1% hit rate would yield 10! This campaign also requires zero additional expense. MailChimp offers a free account good for sending 2,000 emails per month, is user friendly, and has a great help center to guide you through setting up and sending your campaign. Facebook ads are a great way to promote special offers for relevant services that homeowners typically need in the spring. For a painter it could be a house painting special or for a pressure washer it could focus on an exterior spring cleaning. The best part of offer ads on Facebook is they capture leads right on the site and simply send the client contact information to the business owner. Setting up an effective Facebook offer and promoting it as an ad is not the easiest option on this list, but the Facebook help center tutorial on offer ads is a great resource for contractors who want to try them out. Ready to launch one of the campaigns above but not sure where to start? Try the help centers on the various sites. All of the above with the exception of Facebook have great customer support and are fairly user friendly. Explore each and see which option makes the most sense for your business and choose the one you are most comfortable running yourself. 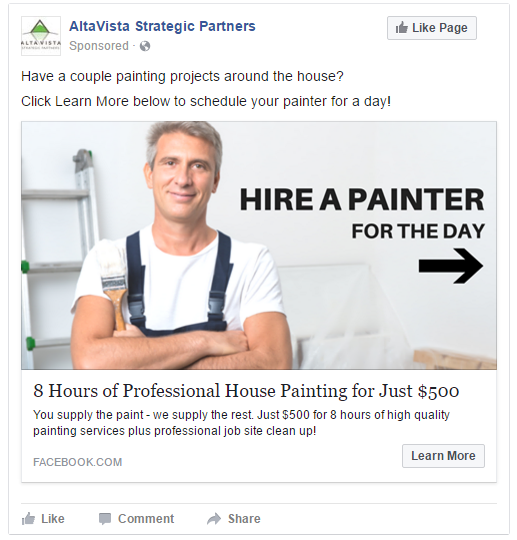 You can also contact the contractor marketing experts at AltaVista Strategic Partners. Their specialty is helping contractors build and execute growth oriented marketing plans. They can be reached by sending them an email or by phone at 1-800-313-2168. Tell them you saw their post on FieldPulse Academy for a free 30 minute consultation.